Besides reducing electricity bills, residents are encouraged to take advantage of Dubai's cheap solar energy to contribute to providing a cleaner environment by installing solar panels in their properties. The Dubai Electricity and Water Authority (Dewa) has invited Dubai's citizens and residents to benefit from the Shams Dubai smart initiative and instal solar photovoltaic (PV) panels on the roofs of premises to generate electricity from solar power and export any excess to the power grid. Till now, Dewa has installed panels to produce 47.3MW of solar power, connected to 1,126 buildings, out of which 5MW are residential villas and the remaining are government, commercial and industrial buildings. "The energy generated is specific to each building, based on design and performance of the solar systems and also the available solar radiation, but the panels could easily contribute to at least 70,950 MWh," Saeed Mohammed Al Tayer, CEO and MD of Dewa, said in a statement to Khaleej Times. This will increase eventually to cover all buildings in the emirate by 2030. Al Tayer added that the Shams Dubai allows customers to avoid using expensive power storage systems by connecting the photovoltaic panels to the network. "The surplus power will be exported to Dewa's grid, which will be deducted from the customers' future bill. 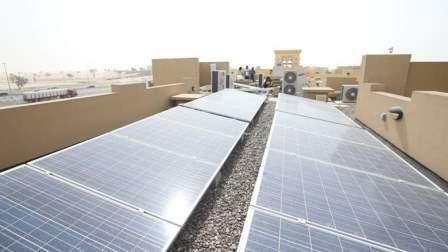 This is beside increasing the value of buildings where solar photovoltaic systems are installed," said Al Tayer.